High density traffic waters ( referred to as "Congested waters") means an area of water where due to presence of many vessels in the vicinity, a repeated risk of collision exists and it may be difficult for own vessel to maintain her course. An area of water where the situation repeatedly arises in which a vessel is likely to collide with another vessel and an action to avoid a collision is limited by the existence of a third vessel or fixed structure, or where such situation is expected to arise. 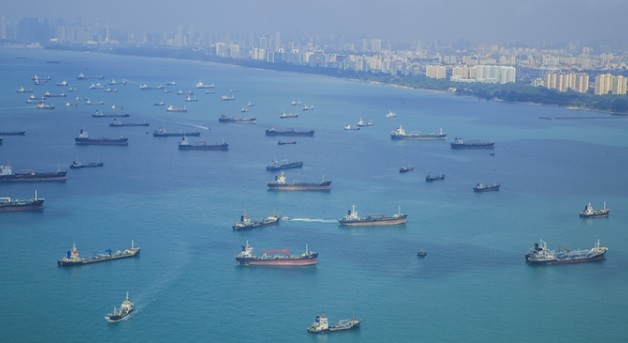 The Singapore Strait is a narrow and busy waterway where a large number of vessels transit daily. These vessels include bulk carriers, container vessels, ferries, tankers, very large crude carriers (VLCC), barges under tow and fishing vessels. 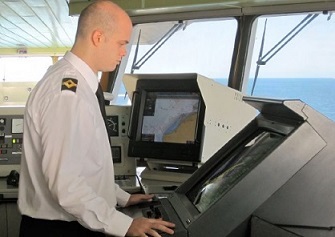 In the interest of navigational safety, shipmasters of vessels navigating in the Singapore Strait are reminded to observe the International Regulations for Preventing Collisions at Seas (COLREGS) and the “Rules for Vessels Navigating Through The Straits of Malacca and Singapore” adopted by the IMO. Rule 6: Every vessel shall at all times proceed at a safe speed so that she can take proper and effective action to avoid collision and be stopped within a distance appropriate to the prevailing circumstances and condition. Rule 8 (e): If necessary to avoid collision or allow more time to assess the situation, a vessel shall slacken her speed or take all way off by stopping or reversing her means of propulsion. 01°11.59’N, 103°50.21’E and between position 01°11.13’N, 103°49.08’E and 01°08.65’N,103°44.30’E. Rule 8: All vessels navigating in the roueting system of the Straits of Malacca and Singapore shall maintain at all times a safe speed consistent with safe navigation, shall proceed with caution and shall be in a maximum state of manoeuvring readiness. Early evacuation from the congested area, if possible. Test of manual steering or changeover to manual steering. Reduction to a safe speed, if required. Running in Parallel of Power units of Steering gears. The Master, when the vessel is in congested waters or upon receiving the report from the OOW above, must confirm the situation and increase officers or ratings for lookout as required. He shall take over the command of the vessel. If the vessel encounters congested waters under restricted visibility conditions, the Master and OOW must navigate the vessel carefully according to the provisions of the "Procedures for Navigation in Restricted Visibility Conditions" in addition to those outlined above. VTS and reporting points, etc.